This is a recipe. A recipe that is natural. A natural cure for constipation. You’re here at Sloword.com, so naturally, I have to give you a story to go with the recipe. It’s in the nature of things here. So there I was, a young lad, a young Punjabi lad, living in a Punjabi household that consisted of, now mark this closely, a bunch of equally Punjabi siblings! Every summer my mom would make a shipload of pickles from unripe, green mangos. This supply of pickled mangos lasted through the year until next summer when the pickling of Punjabi pickles was performed again. However, this post isn’t about pickled mangos or aachar, as we called it. For before summer came rollin’ around, you’d be lucky to get out….. <Digression Alert #3: watch Joan Baez and Jerry Shurtleff at Woodstock to understand that… >. Yes, Before summer came spring. Spring begat warmer sun and the warmer sun begat purple carrots and the purple carrots begat kanji and kanji begat a drink and the drink begat a taste that lingers and the taste begat this memory. Did you know that carrots, the real, original carrots were not orange at all? Yes. Before Bugs Bunny, there was William the Silent. This quiet prince, became the ruler of Orange in 1544. < well, before Bugs Bunny, indeed cinema, came into being. > William the Silent thus became William of Orange, at which point he led the Dutch in complete silence in revolt against the Spanish in the late 1500s. I have no idea what the Spanish were doing there. At that moment in history they seemed to be spreading in all directions. Rather like you spread orange marmalade, heh heh. The revolting William, thus caused the Dutch to become independent from the Spaniards, who went off to South America, instead. The Dutch Republic, thus, came into being, the quietest country in the young world at the time. Thus, when spring came around where I was, when I was, a young lad, we got, in the markets something different from the usual orange carrots. Yes. 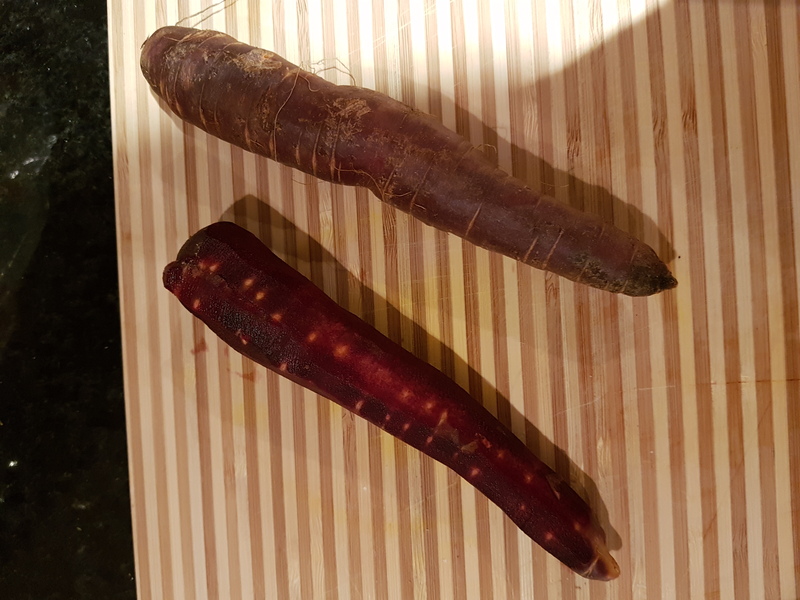 For a limited time, while supplies lasted, the vegetable in select markets, such as JaduBabu’s Bazaar in Bhowanipore, in the erstwhile capital of English India, viz Calcutta, now Kolkata, displayed for sale carrots of a dark purple color. My mom would buy them and make kanji out of them. I would drink it. End of recipe. No, I’m just kidding ya! The real recipe is to be found below. I made this a few times recently and with each attempt, each version, I’m getting better and better. So let’s talk about this elusive kanji. oil water. Look around and find a stainless steel pot. We Punjabis know it as pateela. Meanwhile, find the mortar and pestle. Root around the cupboards and extract the bottle of mustard seeds. Pour a handful into the mortar, the bowl like thing, and pound it with the pestle, the short, fat baseball bat thingy. “You should use rock salt”, said the voice over my shoulder. Perform more rooting about in cupboards and uncover a glass jar with pink, translucent rocks in it. Look in wonder at the little stainless steel grater that came with it. Attempt to grate some of the rock into the mortar. Give up in disgust. Take the smallest rock and break it with the pestle. Use the smallest of the pieces and drop the biggest pieces back into the jar. Now, cut the carrots into strips. The bunch I had consisted of white, yellow and purple carrots. Hey! These must have been the originals! Now, then. Drop the carrots into the boiled and still hot water. Pour in the salt, mustard powder and stir. Let it sit, with a lid on top. Stir the contents and peer hopefully at the mix. “Is it drinkable, though?”, asked The Suspicious Doubter. Stir the contents. Pour some into a glass and drink deeply. After you stop gagging, put some fresh water in to dilute the solution even now coursing through your alimentary canal. More rooting around uncovered a tall beer pitcher. Use that, cover with a small plate and spend all day ( it was a Sunday ) moving the jar about to catch the very weak, late winter Canadian sun. Try it again, diluting this time before quaffing. I peered at it, hope vanishing at the smell and the look of it. Same as before. This time buy exactly 4 purple carrots. Reduce the quantity of ingredients to match. Better than v 1.0. Not yet quite there. However, we’re on the right road. Maybe v 3.0 will get us to product maturity. Maybe, we should learn to measure ingredients, instead of eyeballing and sloshing them together willy-nilly. Well, when I try V3.0 I may inflict that story on you. Well, I will comment for free- keep at it and inflict it on us when you finally get it right. Ah! Yes. All comments, as you ave correctly surmised, are free! Free and acknowledged! Acknowledged and appreciated! Appreciated and welcomed!